"Dublin isn’t all about tradition and pints of Guinness and leprechauns"
The capital is being turned into a huge art gallery in September. ART IS WONDERFUL, but do you sometimes think it can be hard to access? You might be a little intimidated or put off by galleries, you might not know where to go, or they might cost money to visit. Step forward Dublin Gallery Weekend, which will see 30 galleries open and 60 events taking place over three days in September, all with the aim of helping people discover more art. In essence, it’s turning the capital into one big art gallery. DGW will take place from 11 – 13 Dublin, so there’s time still to plan your trip. It will see a number of special events, exhibition openings, artist and curator talks, walking tours, late openings and workshops taking place across the city, from locations such as IMMA and Douglas Hyde to smaller galleries. 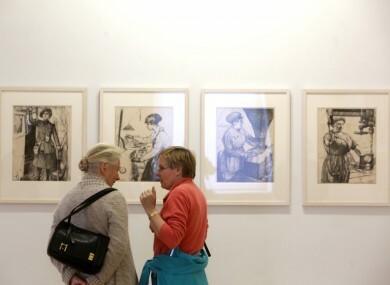 Organiser of the event is Rayne Booth, curator of Temple Bar gallery, who said that the weekend grew out of the Dublin gallery map she was involved in creating for the past three years. Dublin isn’t all about tradition and pints of Guinness and leprechauns – there is actually a lot of contemporary interesting stuff happening here and the arts scene is really strong so we are really lucky. She pointed out that the event is not just for seasoned gallery visitors. It’s all about taking the opportunity to explore what’s out there. She said the weekend is also for people who want to visit a gallery for the first time. Booth acknowledges that some people may be put off visiting galleries because of some preconceptions they have. “Like any area of life it can be a bit intimidating,” she said. Anything you are uninitiated in can be intimidating. The design of some galleries can be intimidating for people as well. They can be wide and pristine and clean and you feel you are being looked at a bit. Also people feel like they need to understand the art – when no one is asking them to understand it. The weekend aims to build on the success of Culture Night, which has been great at getting people in to visit studios and galleries. Find out more by visiting the Dublin Gallery Weekend official website. Email “"Dublin isn’t all about tradition and pints of Guinness and leprechauns"”. Feedback on “"Dublin isn’t all about tradition and pints of Guinness and leprechauns"”.